A 50-year-old Eastbourne man was arrested on suspicion of attempted murder over the Bank Holiday weekend. He was later released without charge but police are continuing their investigations and appealing for witnesses. Sussex Police say officers were called to a report of a serious assault at a property in Northbourne Road at 10.20pm on Monday (May 30). The air ambulance was called to the scene but the man was taken to the Royal Sussex County Hospital in Brighton by road. The road was closed for a time while emergency services were at the scene. Police say the man discharged himself on Tuesday morning. Stuart Abrahams, 47, of Snowdon Close, Eastbourne, was arrested and charged with attempting to cause grievous bodily harm (GBH) with intent and possession of an offensive weapon in a public place. He was due to appear at Brighton Magistrates’ Court today (Wednesday). A 29-year-old man from Eastbourne was arrested on suspicion of encouraging or assisting in the commission of an offence and later released without charge. 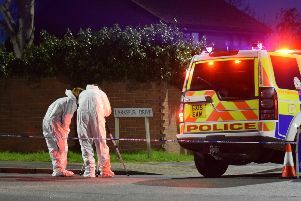 A 50-year-old man from Eastbourne was arrested on suspicion of attempted murder and later released without charge. Anyone with information about the incident or who may have witnessed it is asked to email 101@sussex.pnn.police.uk or call 101 quoting Operation Wyoming.